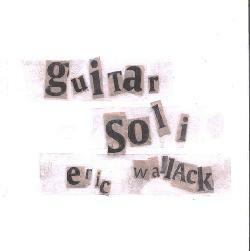 Eric Wallack - "Guitar Soli" / "Galaxies"
Guitar Soli is Eric Wallack's latest set of solo acoustic guitar and a worthy follow-up to the wonderful Grendel CD. When I first read in the promo sheet that part of the intention of the album was to offer listeners higher quality audio than Grendel I scoffed a bit, as I thought the sound on Grendel was just fine. But with headphones on it's clear that Guitar Soli is indeed a superior experience in terms of sound quality. Like Grendel, all the pieces are completely improvised live, with no overdubbing. "No Towel, Eh?" opens the set with nearly 12 minutes of beautifully melodic solo acoustic guitar. I've said in the past that Eric brings the late Michael Hedges to mind and indeed that is the case here. Not because of any acoustic guitar pyrotechnics (that comes in subsequent tracks) but because the style and overall feel reminds me of Hedges. But Eric speaks in his own voice and he is a passionate orator, running through a gamut of thoughts and emotions, all communicated by the interplay between hands, fingers, strings, and the body of the guitar. Throughout much of the rest of the album Eric explores similar, but also somewhat more avant-garde territory, though the music is still quite tame in terms of accessibility. And this is part of the magic of Eric's playing. He occupies a difficult to describe middle ground between adventure and experimentation on the one hand, and familiarity and serenity on the other, much in the way that musicians like John Fahey did in the past (another artist Eric's music recalls). This is challenging, but highly approachable music, with much to please the discerning listener as well as anyone who appreciates thoughtful and well played acoustic guitar. It's great hearing chops and proficiency that are teeming with emotion and a genuine sense of exploration as opposed to mere flash. If you enjoyed Eric's Grendel CD then you're guaranteed to love Guitar Soli. Galaxies is a 4 track, 15 minute mini-disc that Eric recorded to test out his newly completed homemade electric bass, though the music on the disc also includes guitar synthesizer and drum programming. The bass has a beautiful sound, each note deep and winding, not unlike a fretless. The music is characterized by the bass laying down the melody and mood, which is a bit jazzy, while the guitar synth creates a drifting cosmic atmospheric aura that surrounds and compliments the bass melody, while the programmed drums provide beats that function more as color and emphasis than any rhythmic role. Of the artists I've reviewed in the past year UK bassist Steve Lawson comes to mind, mostly due to the spacey jazz elements. The last track, "Nebulae", is my favorite, having the fullest and most pastoral, though still cosmic sound. Very nice stuff and I'd love to hear some extended and more fully developed works in this style, and collaborating with others offers tasty possibilities. 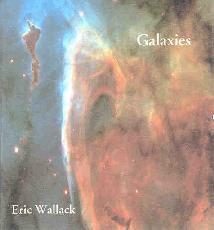 Galaxies is available for $3 and Guitar Soli for $6 from Eric Wallack; 445 North Main St; Bowling Green, OH 43402.